Colorado uses Game Management Units (GMUs) to describe hunting boundaries. National Geographic has created Map Pack bundles to aid hunters with planning and backcountry use. 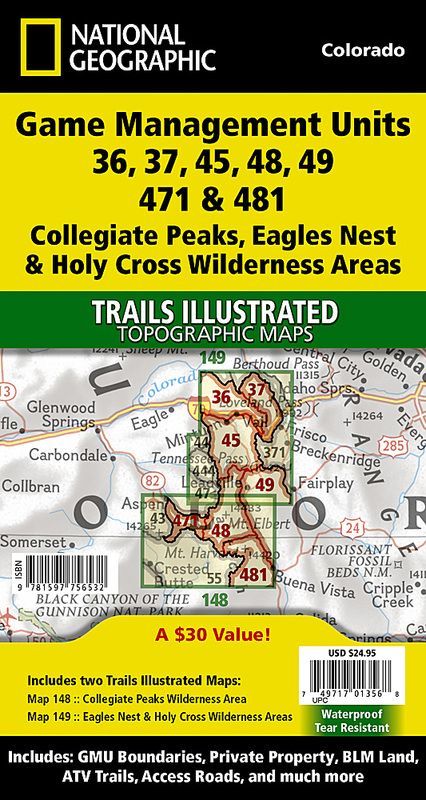 This Map Pack covers the Collegiate Peaks, Eagles Nest, and Holy Cross Wilderness Areas by bundling two maps to cover the entire area. The GMUs covered are 23, 24, 25, 26, 33, 34, and 35. The maps include GMU Boundaries, Private Property, BLM Land, ATV Trails (outside of wilderness areas), Access Roads, and much more.